00.42 / 18.42: Carlsen neutralizes all attempts by Black and now has a winning position. Carlsen has two minutes, Karjakin only seconds. 00.36 / 18.36: After a tactical sequence Karjakin lands in a position in which Black is an exchange down but might have entertain hopes to create swindling chances against White's king. Karjakin has only seconds on the clock, Carlsen still has three minutes. 00.31 / 18.31: Karjakin now has less than a minute on the clock but there is still no counterplay in sight. If Carlsen does not blunder he should at least draw this game and win the match. 00.26 / 18.26: Maurice Ashley in the commentator room thinks that Carlsen's position is so good that Carlsen might even decline should Karjakin offer a draw now. An idea that Judit Polgar thinks to be very unlikely. 00.22 / 18.22: Karjakin is searching for a way to create counterchances and is now down to five minutes. 00.17 / 18.17: According to the engines White has a clear advantage - Carlsen gets closer to winning the match. 00.05 / 18.05: Carlsen is playing solidly, Karjakin tries to create chances. But the engines still like White. 23.59 / 17.59: Carlsen is playing quickly and confidently. And Sergey Karjakin has to find a way to create chanbes. But "the position is so terribly passive" - Judit Polgar. 23.54 / 17.54: Things look good for Carlsen: the engines like his position and he is five minutes ahead on the clock. 23.49 / 17.49: Karjakin is again behind on the clock. After 11 moves Karjakin has 19 minutes left, Carlsen 24. 23.46 / 17.46: After winning game three of the tie-break for the first time Carlsen takes the lead in the match. 23.41 / 17.41: Game four was a Sicilian in which Carlsen avoided the main lines with 5.f3. 23.30 / 17.30: Carlsen wins game three! Karjakin finally cracked under the pressure and now has to win game four with Black to even the score. 23.27 / 17.27: Judit Polgar: "I think Magnus will win this." Karjakin now is down to less than one minute. 23.26 / 17.26: Judit Polgar: "It is very difficult to defend this position. I wonder if Karjakin will work his defensive magic again." 23.23 / 17.23: With 30...e4!? Carlsen sacrificed a pawn - once more, trying to put pressure on Karjakin. 23.21 / 17.21: After 30 moves Black is slightly better and Karjakin has less than three minutes on the clock - Carlsen still has ten. 23.10 / 17.10: After 24 moves Karjakin is already down to five minutes while Carlsen still has more than 15 minutes left. And the position on the board is slightly better for Black. 23.09 / 17.09: Judit Polgar: "Does Karjakin rejoice in defending these bad positions? I mean, the draw in game two must have felt like a win." 23.04 / 17.04: After 22 moves Karjakin is on the defensive again and with 22...a5 Carlsen plays on both sides. 23.01 / 17.01: Body language indicates that Carlsen recovered from game two and is trying to play for a win again. 22.54 / 16.53: After 19 moves Karjakin is down to 15 minutes, Carlsen still has 20. And the engines like Black's position better. Carlsen is starting an attack on the kingside. 22.51 / 16.51: After another miraculous escape by Karjakin, a lot of people suddenly seem to see Karjakin as favorite to win the match. However, after two tie-break games it's still 1-1. And Carlsen has a good position in game three and is again ahead on the clock. 22.45 / 16.45: Karjakin seeks the confrontation and Carlsen accepts. He is getting active with Black and another tense game might be ahead. 22.42 / 16.42: Whether one supports Carlsen or Karjakin - game two was a thrilling drama. 22.38 / 16.38: Game three saw another Ruy Lopez. But this time Karjakin seems to try to push. 22.36 / 16.36: After a break of ten minutes game three began - and Carlsen was still visibly shaken by the events of game two. Magnus Carlsen at the start of game three. 22.22 / 16.22: Draw! Karjakin escaped once again - with only seconds left on the clock he found a way to draw the game and saved a position in which he was lost. The story of the match seems to repeat itself - and the question is how Carlsen will cope with the psychological of missing yet another chance to win. 22.17 / 16.17: Karjakin has only seconds on the clock but Carlsen does not seem to have a clear idea how to win. 22.13 / 16.13: Carlsen missed a win and is under two minutes on the clock. 22.11 / 16.11: Carlsen sacrificed a pawn to initiate a mating attack with the two bishops and his king. 22.09 / 16.09: Carlsen improves the position of his king and seems to edge closer to a win. 22.05 / 16.05: Karjakin now just lives on his increment. But Carlsen has to find a way to break through. But as he said after game four of the match: "I do not believe in fortresses." 22.03 / 16.03: Carlsen is down to 3 minutes. He offered the exchange of queens and an endgame arose in which Carlsen has the two bishops and Karjakin a rook. 22.01 / 16.01: Carlsen takes a lot of time, a sign that he is not sure how to convert his advantage to a win. 21.59 / 15.59: Maxim Dlugy: "But it's not ever yet. White still has to win." 21.56 / 15.56: Carlsen plays calmly and tries to exploit his advantage on the board and the clock. 21.53 / 15.53: Karjakin has less than one minute left, Carlsen has 11 minutes left. And the engines see a 75% winning chance for Carlsen. 21.51 / 15.51: Judit Polgar: "If Sergey keeps this position - he really is a genius." 21.49 / 15.49: Judit Polgar: "Sergey Karjakin is very close to losing." His position is worse and he is under two minutes on the clock. 21.47 / 15.47: After a tactical sequence Carlsen has two pieces for the a rook and has a clear advantage. Not to mention the clock - 3 minutes for Karjakin, 12 minutes for Carlsen. This game has good chances to decide the match. 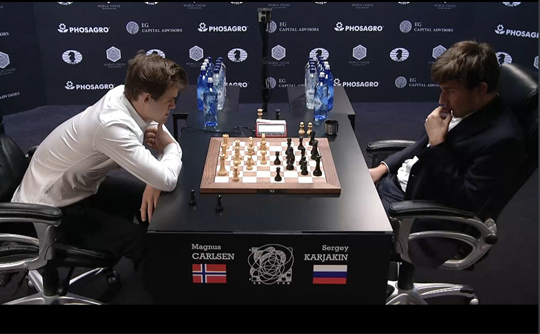 21.44 / 15.44: Carlsen sacrificed a pawn and put Karjakin under pressure. Judit Polgar: "Karjakin is in a very critical position now." Carlsen is a pawn down but the engines see a slight advantage for White. And Karjakin is under four minutes on the clock. 21.39 / 15.39: After 19 moves Karjakin is down to 7 seven minutes - Carlsen has 15 minutes left - and the engines think that White is slightly better. 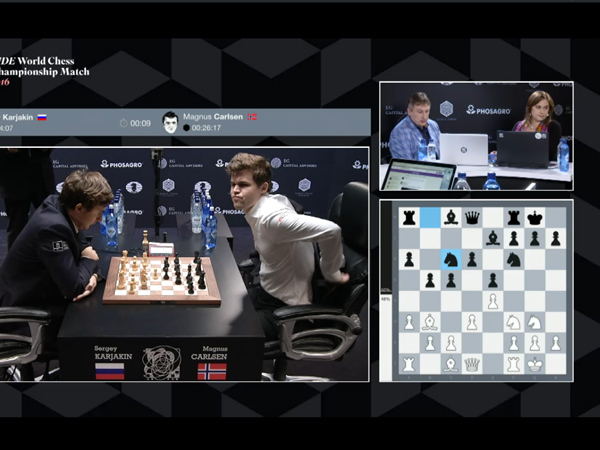 21.34 / 15.34: Maxim Dlugy is commentating again and thinks that Carlsen should try to keep the tension up to emphasize his advantage on the clock. 21.32 / 15.32: Carlsen again has a slight plus on the clock: after 18 moves Carlsen has 16 minutes left, Karjakin 12. 21.30 / 15.30: After Karjakin pushed a pawn on the queenside the position suddenly flared up - and should be better for White, at least, according to the engines. 21.25 / 15.25: After 15 moves the position is equal - and Judit Polgar thinks that Karjakin plans to continue to defend solidly to provoke Carlsen into risking too much. 21.23 / 15.23: Sergey Karjakin and his wife on the way to the playing hall. 21.17 / 15.17: Really? Is it that simple? More of the same, just faster. The first one to deviate from the 1 e4 e5 treadmill will win the match. 21.15 / 15.15: After 12 moves Carlsen is again ahead on the clock. He has 23 minutes left, Karjakin 20. 21.08 / 15.08: Game two began with an Italian. The players followed theory and played the first ten moves quickly. 20.52 / 14.52: Draw! After 37 moves the first game of the tie-break ends in a draw! 20.48 / 14.48: The engines evalute the position as absolutely equal but maybe Carlsen wants to try to exploit his advantage on the clock. 20.45 / 14.45: After 33 moves Karjakin is down to five minutes, Carlsen has ten minutes left. 20.44 / 14.44: With 33.f4 Karjakin gets active - but weakens the black squares around his king. 20.40 / 14.40: The position looks drawish but both players seem to be willing to play on and to try something. 20.35 / 14.35: After 30 moves the position simplified and a draw does not seem to be far away. 20.33 / 14.33: Judit Polgar: "Both players seem to be happy that the first game is so solid." 20.32 / 14.32: After some quick moves from both the position simplified and the engines say that's is equal. 20.28 / 14.28: Maxim Dlugy: "What is the only way not to lose on time in blitz? - Play faster than your opponent!" Karjakin is down to 11 minutes, Carlsen has 17 minutes left. 20.25 / 14.25: Judit Polgar: "I have a feeling that Carlsen is playing solid strategic chess and fast." 20.22 / 14.22: After 17 moves the game gradually takes shape in the middlegame and Carlsen is taking more time for his moves. However, with 19 to 13 minutes he is still much ahead on the clock. 20.13 / 14.13: Maxim Dlugy: "In blitz and rapid it is important to play good, solid moves. You simply do not have time to search for the best move." 20.11 / 14.11: Carlsen plays the opening quickly and after 15 moves he has eight minutes more on the clock than Karjakin. 20.05 / 14.05: The World Champion removes his jacket. Dlugy thinks that Carlsen is still in his preparation - he played ...Rb8 rather quickly. 20.03 / 14.03: Maxim Dlugy joined Judit Polgar in the commentary room and explained some of the basic patterns of the Ruy Lopez. Maxim Dlugy, our man in New York, knows a lot about rapid and blitz. 20.01 / 14.01: The tie-break began. With a Classical Ruy Lopez again. 19.57 / 13.57: Judit Polgar: "Today is the day. Today, we will have a World Champion." 19.50 / 13.50: Judit Polgar: "After game 12 both players looked as if they were World Champions. But now I feel that there's more pressure on Magnus Carlsen." 18.02 / 12.02: Sabrina Chevannes predicts a decision in the rapid games. She is visiting our headquarters in Hamburg to produce some "My First Repertoire" DVDs and says: "It's Magnus' birthday today, and what better birthday gift than to be awarded the title of World Chess Champion yet again. I believe that he has been conserving his energy for this rapid showdown and will show the world who's boss in the first four games. Prediction: 2.5-1.5 to Magnus." 16.56 / 10.46: Only three more hours to the tie-break. As a warm-up here's a blitz game Carlsen and Karjakin played at the Fide World Blitz Championship 2015 in Berlin. What do you think about the World Championship in New York? Very interesting, two young people, almost equally strong. I think Karjakin is very well prepared, Carlsen less so. Does Carlsen play his best chess? No, definitely not. I think, he is not 100% focused on the match. Maybe he did not take the task seriously enough. His schedule is probably too tight. Today he's here, the next month he's there. He does this and he does that. But you cannot juggle too many balls at once. For Karjakin things are different. For him, the match is the highlight of his career so far. And Carlsen was already down. After his loss in game eight Carlsen prepared a risky line in the Ruy Lopez. He easily could have lost a second game. He was lucky. What did you predict before the match? Before the match I did indeed risk some money at the bookies, not much, just a little, and I bet on a 6-6. I have to admit that I support Karjakin a bit more than Carlsen, you always root for the underdog. But I also have another reason: Karjakin and I are both Capricorns, born on January 12. I am only a bit older - 48 years! But Capricorns have stick together. What was the best game of the match? Carlsen's win in the Italian. Well, the last game, that was terrible. In this situation Fischer would have played on to the bare king, 100 moves or more if necessary. What do you think about the format of the match? Much too short. Twelve games, that is not enough. And the tie-break, terrible. Tennis has a tie-break, hockey has sudden death, soccer has a penalty shootout. All very similar to the actual competition. But rapid or blitz chess is something entirely different than classical chess. In the opera you can neither start as tragedy and finish as comedy. What is better, a tie-break or the rules we had in previous matches - if the match is equal, the World Champion keeps the title? Well, a difficult question: I once discussed it with Fischer, in Budapest. Fischer thought that it would be best to toss a coin. Your prediction for the tie-break? I think, Carlsen is better in these disciplines and he will win. 10.50 / 04.50: Not everyone is happy that a rapid, and possibly a blitz tie-break, will decide the World Championship in classical chess. Yesterday, Yasser Seirawan proposed a "radical solution" to avoid such tie-breaks in future World Championship matches. Seirawan's proposal provoked an enormous response. 09.04 / 03.04: As luck would have it, today is Magnus Carlsen's 26th birthday. He was born on 30. November 1990 in Tønsberg, Norway. This makes Carlsen a Sagittarius. For this star sign horoscope.com has some advice for today: "Don't let others push you into places you don't want to be. The key is to probe deeply with your penetrating mind and share your incredible insights with others. Don't be surprised if your actions cause some tension. Don't let this stop you from doing what you feel is right." Sergey Karjakin was born on 12. January 1990, in Simferopol, Ukraine. His star sign is Capricorn. horoscope.com also has advice for him: "Emotionally speaking, you're probably doing quite well today, Capricorn. You have extra self-confidence to draw on to tackle your projects. The one difficult aspect of the day probably has to do with some sort of mental challenge that for some reason just isn't making sense. Don't continue to beat a dead horse. If things don't want to budge, let them sit. Tackle them later." 08.08 / 02.08: Here are the basic rules of the tie-break - we will see a minimum of three and a maximum of 15 games. The players start with a four-game rapid match (25 min + 10 sec/move). Karjakin has the white pieces in the 1st game. In case of a 2-2 after four games, the match will be decided by blitz games. The blitz phase consists of two-game-blitz-matches (5 min + 3 sec/move). If the first blitz match also ends in a 1-1 draw, another two-game-match follows - up to five in total. If these five matches all end 1-1, Armageddon will decide the match. This format guarantess a winner, as in case of a draw the player with the black pieces will be declared as the winner. In this format, White has five minutes, Black only four. An increment of three seconds is given from move 61. 07.45 / 01.45: According to the live ratings Carlsen is a slight favorite in rapid and in blitz. Interesting you mention their horoscopes, because the Runes here <a href="https://spiritnavigator.com/free-readings/runes/situation/"> https://spiritnavigator.com/free-readings/runes/situation/ </a> also also provided some interesting insight about the two players. Lajos Árpád: egyetértek! I accept your position. @Balthus, those of us who criticize the system are not necessarily hating Carlsen. For example I hoped he will win and was happy to see that happen, but I was not happy to see the World Championship decided in rapid games. In my opinion Karjakin was not acting as a challenger. He was banking on the fact that the match is absolutely equal after 6-6 tie and he hoped that Carlsen will overpress, which actually happened. If the challenger does not win the title in case of a tie and there are no chances then, then - as you correctly pointed out as well - he will play fighting chess until he has more wins than the Champion. Then the Champion will play fighting chess and so on. I do not share your opinion that this was a convincing title defense. 6-6 does not convince me. But the challenger's right to become World Champion was even less convincing than the defense of the title. The system must change to make sure that if there is a difference between the strength of the players (in this case Carlsen was stronger), then it will be reflected in the final result as well. @RodriguezSoler: you are fighting a strawman. My remark about "who cares" referred primarily to the football analogy, which is just an analogy (though far better at that than the Schumacher reference), not equivalence. Every game is (or should be, unless one party is a natural-born loser) adapted to the requirements and to the possibilities. I do not see why there should not be a quick draw if _under_the_given_circumstances_ both players consider a draw the best possible outcome. There are no more draws in the "1.e4 draw" fashion because rules have been passed to make that impossible. But if there is a (mutual) will, there's a way. As per Kasparov, you should get your facts right. Here's something for a reality check. http://www.chessgames.com/perl/chess.pl?tid=55015 - Kasparov's (partly successful) war of attrition from game 10 onwards is hard to deny there. The draws are not the problem, is the attitude of game 12, accepting to tie the match, because he knows that he is favorite in the tiebreake. For me this is not the attitude of a real champion. I do not hate Carlen at all, in fact, I wanted him to win because I prefer his style than Karjakin's one. It's hard to imagine Kasparov doing the same in that situation. I predicted a sacrifice!! I was amazed to see it on the very last move of the match!!! On a more constructive note: Yasser's proposal, with the proviso that the reigning Champion has black and the draw advantage in the final game, would be sensible in my view, too, if there is no draw advantage like there was in Kramnik vs Leko in 2004. Giving the Champion black also makes sense due to the common sequence of WBWBWBBWBWBW-B alternation. O, such short-memoried people crying for Kasparov vs Karpov and forgetting what a farce that match came to at one point, where the rules even had to be changed to put an end to an otherwise apparently infinite string of draws. Age and experience often leads to that kind of false nostalgia. And the Schumacher comparison, ha ha. Where it is always at least half a matter of the engine (ironically) in the car put under you. At the bottom of all this moaning is a deep aversion to Carlsen and his assumed antics. I for one believe Carlsen has proved his worth again. If you want a better sports analogy, refer to Atletico vs Real in the UCL. Extra time, penalties, Real beating Atletico twice in three years. Real has 2 (+9) titles, Atletico zilch. Who cares how it happened? The rules were equal and known to both parties well in advance. Only haters will hate. I wonder how anybody can doubt that Carlsen _is_ the best chess player in the world today. What kind of chess blindness does it take to assume otherwise? Also: as koko48 pointed out, Karjakin's only win came from Carlsen's hubris and recklessness; Karjakin never took any considerable or real risk to force a win and when he could have increased the pressure in game 10, let's face it, he blundered. It is always the rules that players play by, and if the Champion had had the draw advantage, game 12 would have been different due to Karjakin's pressure. Maybe TB4 50.Qh6+ would have happened then. Would today's traditionalist moaners be any happier then? I doubt it. Decide the classical world championship with rapid and blitz games tie-break makes the same sense of decide the rapid or blitz world championship with classical games tie-break. For 550,000 pounds, Carlsen sold 13.2 rating points to Karjakin who got 450,000 pounds change from FIDE/Argon duo. If the statistics of the illustrious non-chess playing duo is anything to go by, then this was just all for show and us, 'the viewers and fans', have just been played! Congratulations for the World Chess Champion! For obvious organizational reasons any tiebreak proposal must be able to be executed in a predictable timeframe. So any solution like "let them continue indefinitely until one wins" is impossible. I would suggest something like "winning on points" as used in martial arts if the match is tied. I think everyone agreed Carlsen was dominant, though he failed to deliver knockout an many occasions, so the result is just. Karjakin made the most contribution to chess in the match I think in making us rethink what "a winning advantage" is in practical play. I mean, drawing all those games where all the commentators were waiting for the resign and all the engines were at +2 and Carlsen though he had it in the bag and he managed to save, amazing! Much more exciting than a boring Queen sacrifice IMO. For me this was the most exciting WC chess match since 1972. Herzlichen Glückwunsch zur WM und Geburtstag ! I hope Carlsen loses the title next time for the betterment of chess, When Schumacher was winning everthing, you guys wanted more competition? @hserusk "At best the World chess championship is at a tie between the two if one thinks in line with the tradition of these matches. (which I suspect most chess fans do)" Huh? Traditionally it would still be a win for Carlsen since traditionally champion had draw odds. Farewell to a strange match. I hate to say it, but this match has definitely cooled my ardor for Carlsen. It was a great disappointment, not so much because it had to go to tiebreaks, lackluster results are to be expected once in a while, but because of the absolute travesty of game 12. Carlsen detractors will love it though. They'll be able, for years, to point to this match to support their belief that Carlsen isn't all he's cracked up to be. "My weird prediction, the match will be decided in a game with an exchange sacrifice!!" Well the match ended in a stunning Queen sacrifice similar to the famous Queen sacrifice by Frank J. Marshall, back in the olden days. Congratulation to Magnus Carlsen fo winning the tie breaks !! and remains world champion. Karjakin gave us a best win in game 8, something unusual and entertaining. In everything there is always advantage and disadvantage. My suggestion is this and I think this is not complicated for readers . If the final score is tied at 6-6 after 12 games, the reigning world champion retains his title, but the challenger will get equal share of the prize. I think this is the best solution, there will be an adjustment in prizes.. No more tie-break. In history, in documentation, in database and in books how can you include the tie break games? It's confusing. Just like when we ask question :What's the final score of the WCC ? how can you answer that, since we have 3 answers to that questions? some will answer 6-6, others 9-7 and 3-1. But if we have classical games ( maybe between 12 games to 18 games,) and no more tie breaks ,confusion and complication is gone. When the final score is tie, the world champion retains the title and the challenger gets equal share of the prize. So it's simple and understandable. Karjakin's match strategy paid off wonderfully in the classical games: stay solid, make a draw whenever feasible, avoid complications, and wait for Carlsen to get frustrated and overpress. Unfortunately for him (and fortunately for the chess world imho, who needs a World Champions who is universally recognized as the strongest player at the moment), he couldn't make it work until the end, and missed a more or less forced draw in game 10. It looks like the stay solid, make a draw strategy just couldn't work in the rapid games, where the strength difference was too much. Play 12 games of Classical, 12 games of Rapid and 12 games of Blitz to determine the Integrated World Champion, with scoring distribution ratio of 3:2:1. Carlsen was not the better player in classical chess. He is the better player in rapid chess. But this here was called classical world championship and not "Classical & Rapid world championship". While I agree that Carlsen is generally the better player, it does not matter if you play for a title which is clear described with the word classical. And in classical they players was at the same level! END OF THE STORY! Carlsen deserved to win. Karjakin played safe, defensive chess with both colors and hoped for Carlsen to overpress. Karjakin never tried to create anything himself. Unlike, for example, Kramnik, who in his match with Kasparov played to draw as Black, but played to win as White. It would have been a shame to see those tactics rewarded. Carlsen is just the better player. If this is what it takes to liven up the play, why not jump into rapid games sooner? Say eight classical followed by eight rapid at two games per day and eight blitz in a one day playoff if the issue is still undecided. Either that, or restore the match to a reasonable length (16 or 18 games) where the players actually have leeway to take risks. So finally in the end the pundits are all proven wrong: drawing is not the new winning, and drawing isn't the same as being ahead. Well done Magnus Carlsen, World Chess Champion! 50.Qh6+! Now THAT'S why we play chess. Great quotation from Vlastimil Hort: you cannot start as tragedy and finish as comedy ! Hopefully this is will be a lesson for players like Karjakin and future contenders to the crown: coward play directed to drawing as many games as possible, only delays the inevitable!! Karjakin did not show any courage, did not risk anything. His opening preparation was terrible from the point of view of generating winning chances and finally got what he deserved. Let's face it Carlsen = Karjakin in classical whether you ilk it or not. So all of the outlandish exaggerations about 'Mozart of chess' hold no water. The guy made one finish move at the end that Tal used to do every day and all of a sudden we forgot 15 games played before. I just imagine what would have happen if Asparov would have tied after 12 classical games he would've been bashed and scroned all over for being weaker than anything resembles an all time best.But Magnus can fail as much as he want and then sac a queen in a 2000's or below level tactic and he became a genius LMAO. 7 ppl are rated higher than his equal rival. .. It turns out rapid games are much more interesting than classical. This game #2 was fantastic i enjoyed more than previous games. Especially the endgame.